In the pantheon of American culinary traditions, there are few dishes as iconic as the good old hot dog. 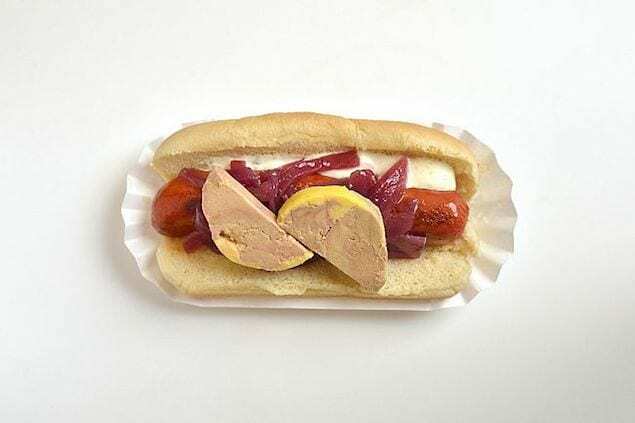 And no better time to eat one than during the summer, where they’re a staple at baseball games and cookouts everywhere, and there’s an entire day (July 23rd) in celebration of the frankfurter. But if mustard, ketchup, relish, and onions are as outrageous as your dogs get, prepared to be wowed by these 15 wild dogs from across the country. If you’re going to eat an alligator dog, there’s no better place to do it than in New Orleans. And there’s no better place for dogs in New Orleans than Dat Dog, where you’ll find regional delicacies like an alligator sausage topped with guacamole, sour cream, pico de gallo, bacon, and yellow mustard, or a crawfish sausage with sour cream, crawfish etouffee, fresh onions, diced tomatoes, and Creole mustard. Chef Tony Maws spent more than a year developing The Kirkland Dog, made from all-natural pork shoulder, grass-fed beef chuck and shoulder and served on a house-baked pretzel bun. “I personally don’t like a soft, squishy hot dog bun,” says Maws. “I don’t like it! I don’t like Wonder Bread, either. For my interpretation, I didn’t want a bun so hearty that you couldn’t bite into it, but I also didn’t want something so soft that it would fall apart.” But you’d better time your visit correctly if you want to try it: The dish is an off-menu item that’s available Monday evenings and served in limited quantities throughout the rest of the week. Casual Mexican favorite The Painted Burro is taking a cue from the Sonoran dog with its Street-Style Hot Dog. The all-beef hot dog courtesy of Pearl Meats, located in nearby Randolph, is served inside a toasted bun with fried pork belly, cabbage and jalapeño slaw, chipotle ketchup and agave mustard. On the side? Pickled veggie salad and charro beans. An old-school dog gets a new-school twist at Nashville’s Paradise Park Trailer Resort, where a jumbo all-beef hot dog gets wrapped in bacon, deep fried and served BLT-style. “I wanted to make the traditional hot dog more fun, and everyone loves a good BLT, so I thought, why not combine the two?” says Max Goldberg, co-owner of Strategic Hospitality. The City of Brotherly Love is giving the traditional hot dog a tropical makeover with The Big Kahuna. This refreshingly innovative dish comes with one of three frankfurter bases—all-beef, vegetarian, or vegan—then gets topped with guava mustard, grilled sweet red onions, pineapple salsa, and an orange habanero aioli. You’ll have to travel 10 miles off the coast of Portland, Maine on National Hot Dog Day if you want to get a taste of this not-so-average hot dog, which pairs a fresh lobster and beef dog with avocado garlic whip and pickled watermelon slaw.